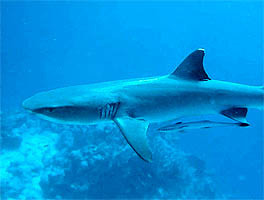 Sharks are more common on some reefs. Click here to see this White-Tipped Reef Shark and its pal the Remora from a reef near Australia. 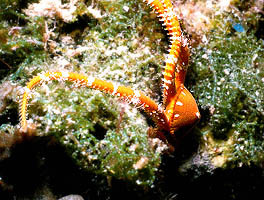 As it crawled out of the reef in the darkness of night, we saw this colorful Orange Banded-Arm Brittle Star at a reef near San Salvador. Click here to learn about this speedy animal.